We made this tonight and it was absolutely delicious! This has everything I love about Indian food. The flavors are bold and vibrant but blend so well together, the warmth and texture are like comfort food, and the dish is quite healthy. If you like split pea or lentil soup, you should definitely give this a try some night instead. We served this with an Indian flavored, sauteed swai (similar to catfish or tilapia) and artichokes, but it could easily be a stand alone dish. Roast the yellow lentils over medium heat in a large sauce pan for a few minutes until they turn light brown. 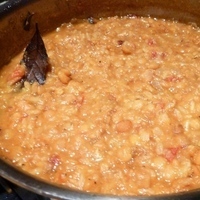 Then remove from heat, add the red lentils and rinse with water, then drain and move to a bowl. Dry the pan, add the oil, bay leaves, cinnamon stick and cardamom seeds and sizzle over medium heat for 30 seconds. Add the garlic, ginger and onion and saute until the onion is golden brown. Add the turmeric, chili powder, salt, sugar, tomato, and serranos and mix thoroughly. Then add the rice and lentils and continue to saute for about 6 minutes. Add the water and when it starts to boil, lower the heat and let simmer for about 35 minutes. Serve on plates or in bowls while hot. This was really yummy. Our kids all loved it...which I was a little worried about. We left the serranos out of the batch we made for them. Our oldest son tasted some before he left for soccer practice while the lentils were still a little hard (about 10 minutes into the cook time) and was BUMMED that it was not ready yet given the wonderful flavor. That sums it up. A winner! Great recipe!! I did cook the lentils a little longer. I put the peppers on the side since not everyone in the family likes the spicy as much as I. Also added artichoke bottoms. Served it with roasted chicken quarters. As I do like curried lentils I want to try this. I will probably leave out the bit of sugar, as that's something I need to watch the intake of. I even found out that my favorite grocery store carries moong dal and whole urad (looks like black mung beans), so I don't need to order special online to get these Indian beans. I'm sure in other areas of the country people have to special order, but not here.